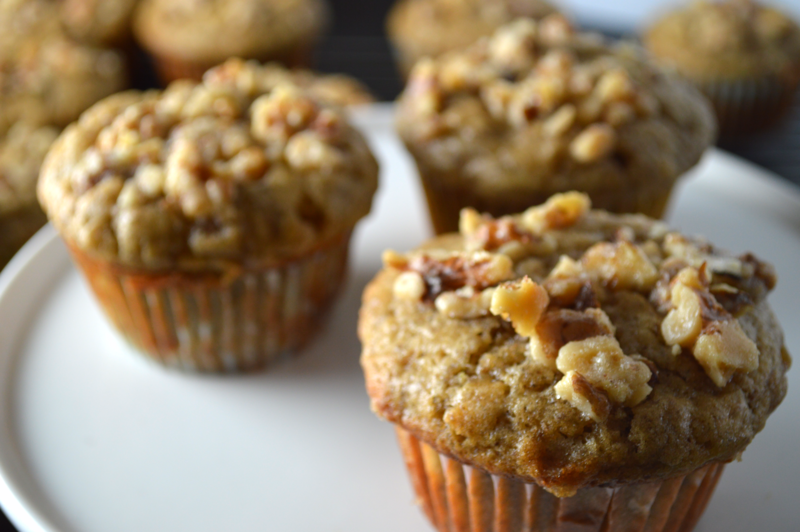 The secret ingredient in these decadent tasting muffins is (drum roll please) ground flaxseed! The ground flaxseed acts as a binder while adding heart healthy Omega-3s. Make sure to get ground flaxseed versus whole flaxseed for this recipe because you want it to mix into the batter and thicken it. I’m also not a huge fan of seeds in my food… just a personal preference. I buy bananas whenever I’m at the grocery store because they are so versatile. I use them in desserts, for breakfast on toast, in smoothies… I could go on and on. If we don’t eat them right away, I will peel them and store them in a ziplock in the freezer. Just make sure to peel them before you freeze them… otherwise, your fingers will freeze off trying to peel them. Yikes! Trust me, I’ve been there and it is not fun. Now, let’s make some muffins. First, whisk together the banana, yogurt, butter, vanilla, and eggs. You could definitely use a mixer for this if you’d like. I decided on the arm workout instead 😉 Next, add in the granulated an brown sugars until combined. Combine flour, flaxseed, baking soda, cinnamon, nutmeg, and salt in a separate bowl. Add the flour mixture to the wet ingredients in a couple of batches. Be careful not to over mix the batter. Line a muffin tin with cupcake liners and spray with cooking spray. Spoon the batter evenly into the muffin tin. An ice cream scoop comes in handy for this step. 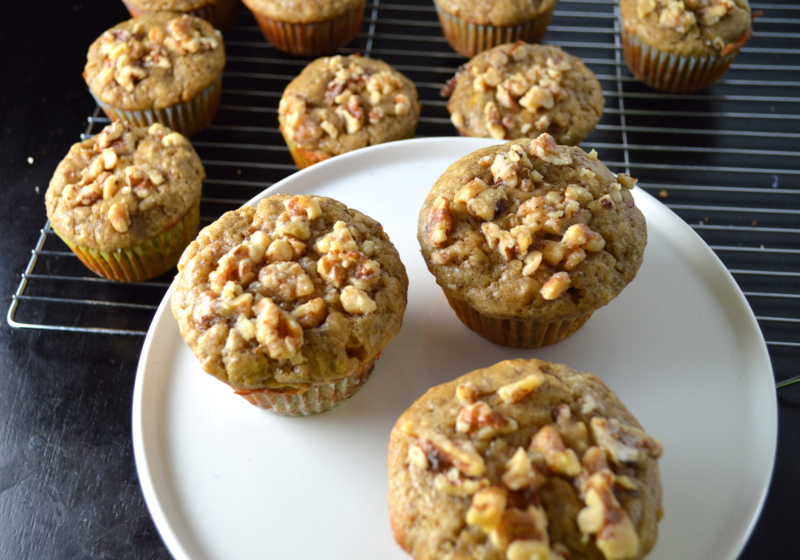 Next up is my favorite part… the walnut topping! Seriously it is so delicious and completely makes the recipe. This was not originally in the cooking light recipe so I added it. My mom likes to add this topping to boxed muffin mixes. It makes them extra special. 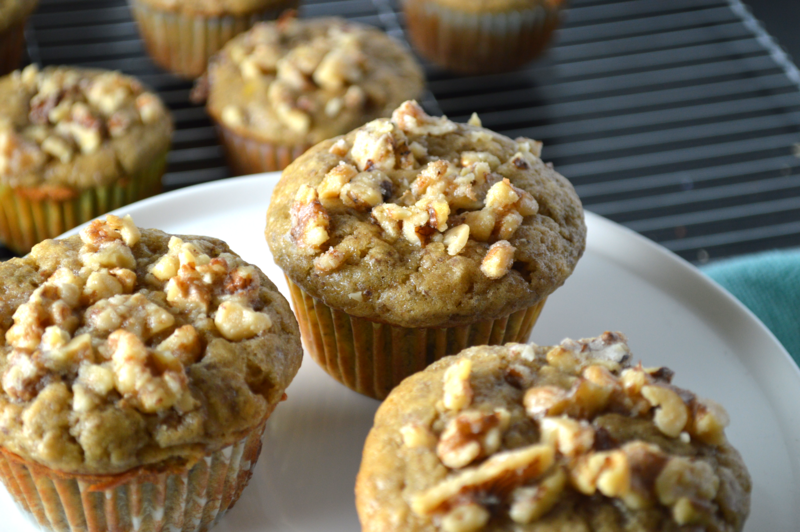 Simply combine the walnuts, brown sugar, flour, salt, and butter with your fingers. Sprinkle the topping on each muffin and you are done. 2. Whisk together the banana, yogurt, butter, vanilla, and eggs. Add in the granulated and brown sugar. 3. Combine the flour, flaxseed, baking soda, cinnamon, nutmeg, and salt in a separate bowl. Add the flour mixture to the wet ingredients in a couple of batches. Be careful not to over mix the batter. 4. Spoon the batter into the prepared muffin tin. 5. Mix together the walnuts, brown sugar, flour, salt, and butter with your fingers. Sprinkle on top of the muffins. 6. Bake the muffins for 15-18 minutes or until a toothpick inserted into the center comes out clean. Keep in mind that oven temperatures can vary. I like to check the muffins at 15 minutes and adjust the time from there if necessary.